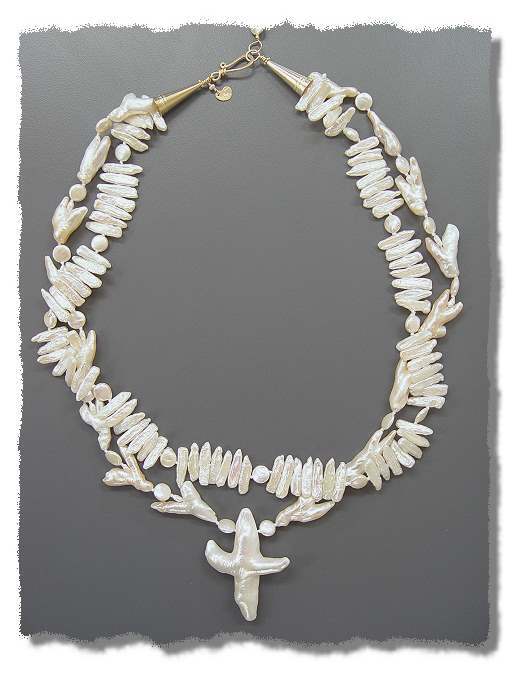 The vendor who sold the pearl cross assured me it is "100% natural." Indeed, when I drilled it I could feel no trace of an implant, the material seemed consistent throughout. He indicated the pearl had grown for 18 years to reach its large size and beauty! What made me want to believe him is that I found this pearl amidst a rather large tray of similarly-sized pearls, but this was the only one which had a distinct cross shape. 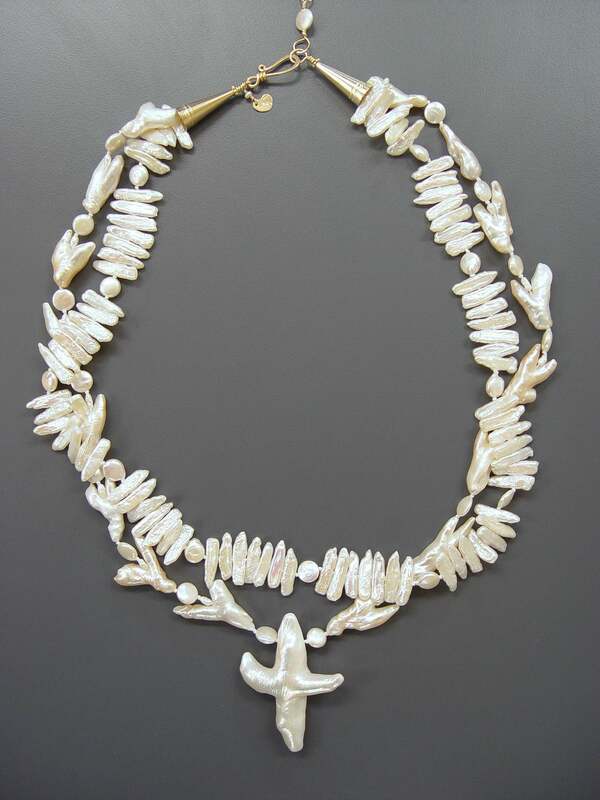 The only way to tell for sure would be to have it x-rayed which is done for high-end Akoya pearls, not with relatively less expensive cultured freshwater pearls. I bought the pearl many years ago before the market was flooded with shaped pearls that are obviously implanted, so maybe this one was an early experiment. The "18 years" of growth was curiously specific. I wish I could always trust the vendors I patronize, but even they can be deceived. As you look you will see it could be a whale or a bird. I liked the sense of hope in the slightly upturned cross bar, so I drilled it to represent a cross. My inexperience with photoshop prevented me from adjusting the color of the earring photo to match the necklace. 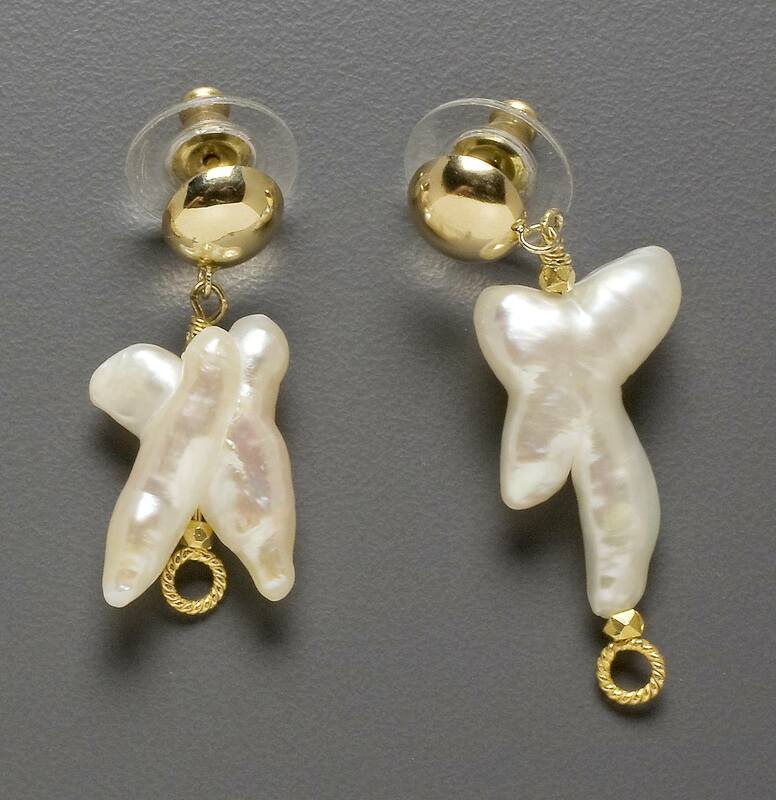 The gold in the earrings reflected off the pearls dramatically in the photo making them appear more golden than they are. In person you will see clearly that the earrings are from the same strand of branch pearls that make up the lower strand of the necklace. This is a beautiful collection of pearls, I hope you will enjoy it! And please contact me if you would like the necklace but either do not want the earrings or would like to have them converted to a clip style.